Do your students get the opportunity to play duets often enough? 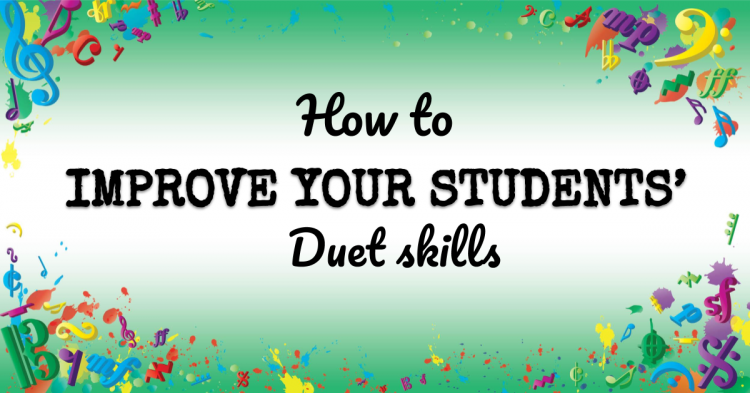 Find out how to fit in more duet playing and teaching tips to set your students up for success with duets in this episode. Hey they’re wonderful teachers. I hope your April is off to an amazing start. So far you’re having some wonderful lessons. And if there’s nice weather that you’re getting I didn’t get a little bit after the long winter especially over in the States. So today we’re going to talk about duet what playing duet playing has many benefits and it’s something that I try to bring into my studio as much as I possibly can and in a way it’s one of the many reasons that I switch to Buddy lessons in my studio so I’ll just briefly remind you buddy lessons are where my lessons overlap in the middle. I’ve talked about this before and I will do more future episodes yearly on that and the logistics around it. But basically all of my students have some time one on one with me or almost all of my students do some time one on one with me and some time together with another student and me. So we have lots of opportunity for playing duets and I love that duets and trios and any other ensemble work is great because it gives students a chance to play socially. So they’re actually playing music with a buddy or with a friend or even if they don’t get along particularly amazingly together it’s about exploring music with another person which is something that pianists just do not get enough time to do. We all know that many other instruments and if you’re teaching another instrument then lucky you because your students probably get to play in band in school or orchestra or participate in other groups. It’s harder for a pianist to find those opportunities they can but duets are a great thing to bring into your studio to make this a baked in part of the experience so that we’re not playing alone for years and years and years and years and then finally playing duets or any other group work and being pretty terrified of the prospect. It also lets students see through this social interaction that other students other kids go through the same struggles they do or similar ones to when they see see another student is mixing up the notes or getting confused read an interval or having trouble with a particular chord they see that everyone finds this challenging at times there are little struggles they get to witness how each other works through that. So especially if you have a student who gives up really fast they’ll quickly knock that out of themselves during duet time because they can’t just give up. They can’t just say Oh well I don’t know or it’s too hard. They generally won’t when there’s another student there and even if your student is not like that it’s very beneficial for them to see that they’re not alone. Other students are going through the same things. It’s hard for everyone at times and yeah they’re normal right. Duets are also an opportunity to play piano in a way that is lighter but also have some practice pressure baked in now that seems like a bit of a contradiction in terms. I’ll give you that but it’s actually not duets are lighter because the pressure is not all on you perform this amazing piece. It’s not everything isn’t riding on your shoulders and generally there’s more giggling going on when you’ve two kids together right. So everything seems a bit lighter but at the same time you’re part of a team and if one student does not practice their part they can feel it right letting down you is one thing or themselves or their parents is one thing but letting down another kid who does things and they generally won’t do it twice. So you have to have that begged and motivation practice because they have to keep up. They have to do their part and they understand that instinctively. You can also help to guide students in understanding the importance of rhythm. Rhythm is vital. It’s so so important but students will often sacrifice it in favor of pitch because we have this preoccupation with note reading in a lot of our lessons or traditions. Students can become overly focused on reading the pit the pit doesn’t matter nearly as much as rhythm and it can be hard to get that message across to students with duets. Just do that they just have this automatic sense that oh rhythm is so vitally important. In fact one of my students actually has been going duets for a while and she’s been struggling with rhythm the entire time she’s studying okay but this year she was playing a duet and we couldn’t get it together. And she particularly like this duet. And it pushed her and she finally started really counting at home not just at the studio when I was making her but really practicing and counting. And working on it and it’s still hard for her. Rhythm is hard. It’s something she finds difficult but that was the push she needed to really start counting and see the difference it made and see how she could actually play in time with your duet partner. And sound fantastic. And it’s led through into all of our other work. Yes it doesn’t solve the issue overnight and I would never expect that with anything but it did make a massive leap forward for us in terms of rhythm work and even with a student who doesn’t particularly struggle with rhythm it can just help to have that focus that understanding that rhythm is vitally important. It is the most important thing. Do not sacrifice it for any reason. Okay so that’s why duets are important. I’d say you’re on board with that duets. We all know they’re a fantastic opportunity for students but it can be hard to find time for them. As I said I do body lessons with my student. So that’s something you might consider then check out the resources on the colourful keys blog and on the podcast here where I’ve talked about buddy lessons because having that overlapping time each and every week with two students together is just one of the best things I’ve ever done for my studio. It’s wonderful. It’s not just for duets it’s also for playing three games for improvising together and for doing all sorts of other stuff but duets are a fantastic benefit of that because two students can be working on duets together as part of their standard repertoire. It’s just what they do. It’s not a special event. It’s just what we do each and every week. But if you can’t teach the very lessons or don’t want to or for whatever reason then maybe you could find another place. What do you get into your studio at least semi regularly. So one way to do this is to have group workshop where students learn duet in advance. They learn their art and then they come together just to practice their duet as a team so they can have a partner that they’re working with on this. And if you have keyboards with headphones and headphones splitter they could be working side by side and you can have several students together or you could just have the workshop be an opportunity for them to practice that a few times and then try to perform it together for everyone at the end of class. We could have several students learn the same duet and learn both parts and all try it in different combinations to get really good at it. Another way to do this is to have special duet weeks of your year where every student comes to two lessons. They come to their own lesson and that of another student. It’s gonna be hard scheduling wise but in most cases you should be able to make it work at least for most of your students right and declaring it a duet week and it’s just for that one week. And parents should be onboard with that if you explain why you’re out there so fantastic for their kids and then find a way to do this is actually try and match people up and get them to have playdates together. So this works particularly well if you have students who are already friends outside of the studio many teachers will have multiple students from the same school they might even be teaching them in the school or just have students who happen to know each other neighbors that kind of thing even if they don’t know each other though you could try and match students up getting in touch with the parents tell them. Mary and Ann are same age are both working under this jet but it would be awesome to organize a piano play date and try to forge some friendships right get them together to play duets or prepared for a concert together and they can do most of the work during play dates and then maybe they have one supervised session with you to polish up the duet and get ready for the concert. Now once you’ve found the time for duets once you’ve found a way to work them into your studio you need to think about developing those duet skills and actually one of my favorite ways to do this is to not work on the duet straight away or at least not exclusively work on the actual duets but to do some duet improvisation instead or as well as I do at work. So the resources I love for those are create first by Forrest Kinney. Talk about his books a lot. Love those books and it’s very easy to simplify the accompaniment that one student can play the accompaniment pattern and the other student can play the scale the improvised station and then they can swap roles. So those books are great for that really wonderful opportunity to play together and explore really diverse scales and interesting patterns. Another way to do this is using resources from music teaching such as the circular folks Odyssey or piano power booster courses. So in those I give improvisation prompts and accomplishments and those can again easily be simplified you could take just the left hand part and the student could play it with two hands if necessary. And that’ll provide a great baseline to go with the scale that the other student is improvising with. Always like both students do both parts when you’re doing this and otherwise just leave them at it. I usually give them an ending give the second part whoever is playing this good or bad. Ask them to come up with an ending. Find Do play it down low that kind of stuff so that they have an ending point and they decide when it ends and the other person needs to follow them follow their lead and stop when the low dough is played or whatever we decide on as the ending. So those are some great activities to do as duet improvisations. Now the reason I like doing to at improvisation to work on duet playing skills is it takes away the element of reading which is one of the stumbling blocks when it comes to playing duets together to be successful playing duet. Students need to keep a steady beat the entire time they need to keep going no matter what. There’s no backtracking a duet playing it just will not work and they need to actively listen and those are some of the benefits that you can get out of duet but they’re also hard skills for some students to establish while also reading. So having the stepping stone or the activity you’re doing side by side with the duet improvisation it means that students can work on these skills without also reading or focusing on playing correct notes there’s no wrong notes it’s an improv even if they go outside of the scale they’re supposed to be in or the pattern they’re supposed to playing. Who cares. Just keep the beat going just keep it steady and just keep moving forward and trying to make nice music together and the whole time listen to the result. Listen to the combination while also playing your part. Ask them questions when they’re finished so that you can see how much they were or weren’t listening. As a second player What was your favorite part of what your partner was playing there. What did you like about what Mary played and if they can come up with some kind of answer means that they actually were listening and a lot of students will readily admit. Oh I was so focused on my part that I couldn’t listen. OK no problem. Try it again. Let’s do it again see if you can listen out for Mary this time right. They’re actually observing what the sound is while they’re playing and if you had students who through all their playing hardly ever listen to themselves it’s like they literally put cotton wool in their ears as soon as they start playing and have no idea what happened when they’re finished. Then this is a great thing for them to do as well. 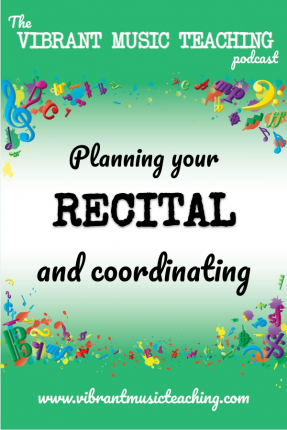 So that you duet improvisation those types of exercises are great to do to establish these skills and work on them further when it comes to actually playing duets. There’s a few simple simple tools these might seem like common sense but if you haven’t helped students in a duet format a lot you just want to give you some tips for how to make it more successful when you’re working and coaching students through duets. The first one is that if they’re wildly straying away from each other just get them to count out loud so that they can listen to each other’s counting. I don’t actually get my students to count aloud while they’re playing all that often. Only from time to time it’s not really a standard practice tool of mine. It’s something I occasionally get them to do but only briefly but with duets it is one of the go to moves because they can so clearly hear how everything fits together and when you’ve got four hands can be hard to see how they’re lining up for students. You know it’s very hard for them to move in their mind. One duet part on top of the other right if they’re printed side by side and see how they would line up together. But once they count both of their parts they can hear it and they can fit it all together. And it also helps with pesky rests that are disappearing or some bits of our disappearing. So counting aloud is a simple way to work on staying in time with each other and finding where things fit together. Another way to do that is an app called super metronome groove box or any drumming backing track doesn’t have to be that app. If you don’t have an iPod it doesn’t matter. All it is is a drumming track it’s just a simple way to do it. So if you don’t have an iPod go on YouTube and just look up drumming. Background tracks and you’ll find them in all different styles. And then just any speed you could possibly want them to be in. And if you have an iPod download super metronome groove box and use that because it’s really handy to have and that’s a much more instinctive way than a metronome. Keep students together so that they can feel the beat and stay in time with the drummer. And it’s a lot more musical and more fun right. It’s just more fun to play with a drummer than it is play with a metronome. Another technique that I use a lot is to get both students to play one part so actually play through our sight read through each of the two parts in unison before they each try their own part together so that they’re actually buying the same thing. It will just help them to read it better to understand the other person’s part even if they never practice it like reading it through the first time together is a great thing to do to have some awareness of what’s going on in the other part. And it will also help to iron out any counting issues that happen in either part because they have to play the same thing as each other. So they have to stay in time and it’ll help to fix that up and then the last tip I would give you is just to take the role of a coach. I said coaching session before and I meant it. You’re not the teacher so much in a duet session. You should be a coach so ask questions. Don’t tell them what to do. Sometimes do but most of the time say what do you think we should do next and make them come up with the answers. That’s a big thing that they can learn from this is working as a team and controlling the practice process and understanding how they can practice things well together. So when they’re finished ask them how it went. Ask them which bits might need more work. Ask them what they think you should do next. Where should we go from should we try it again from the beginning. Should we try. Just one bit. Which bit do you think needs the most work. Is there any part that one of you wants to try and your own to get it sorted before we try it again and always as much as possible get them to count in. So say you’re gonna start in the middle. They decide actually the B section is not making sense for either. So we need to go over that a few times. Great. So they’re starting from bar 13. Get them to count in and I usually leave it up to them. Who does it. OK. Who’s gonna count it. And then Mary says yep I’ll do it. So Mary says one two ready play and they start in again together. In action with my real student then you can find it in the teaching videos in my video library and vibrant music teaching. So if you’re not a member yet just go to VMT.ninja and sign up and you’ll get access instantly. And if you’re already a member hop on over to the video library and select the teaching videos to check those out. The above audio transcript of “VMT 037 – How to Improve Your Students’ Duet Skills_DELIVERABLE.mp3” was transcribed by the best audio transcription service called Sonix. If you have to convert audio to text in 2019, then you should try Sonix. Transcribing audio files is painful. Sonix makes it fast, easy, and affordable. I love using Sonix to transcribe my audio files. Subscribe to the podcast in Apple Podcasts or iTunes here so you don’t miss the next episode and you can take it with you as you run errands, clean the house or walk the dog. If you’re enjoying the podcast please take a moment to leave a review and a rating. Love all of the ideas, Nicola! At our music school – westkelownamusicschool.com – we have a Christmas Ensembles only recital every year! It is a great way to building school community and have our students become comfortable with duets, trios, etc.